The scheme is known to be a major factor in motivating people from lower strata of society to enrol their children in the educational institutions in far-flung areas. Authorities in Doda district of Jammu and Kashmir have suspended an official and ordered an inquiry following allegations that students of five government schools were not served mid-day meals for the last nine months, an official said Sunday. 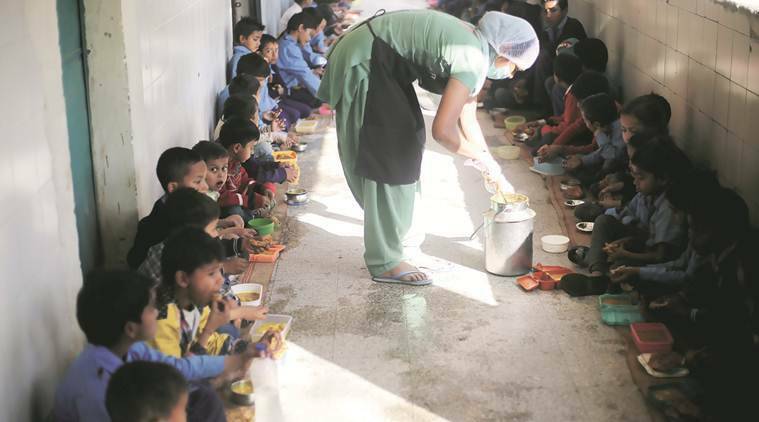 Chief Education Officer (CEO), Doda, Mohammad Sharief Chouhan took the action after receiving complaints with regard to the non-serving of mid-day meals in all the five primary and upper primary schools, out of the six government schools, in Tanta panchayat since March. “This is a very grave issue as government is very particular about the implementation of Midday Meal scheme…all the government primary and upper primary schools of Doda district, including Dramman, Kuthal, Kushethawa, Bagran and Wanipura, of Tanta panchayat have been regularly sending messages about MDM being served on every working day without any fail,” Chouhan told PTI. He said the incharge teacher of Wanipura primary school, Fateh Mohammad, has been placed under suspension with immediate effect and an inquiry has been ordered to look into the issue. The principal higher secondary school, Jangalwar, would conduct the inquiry and was asked to submit her report along with specific comments and recommendations in the matter within a week’s time, he said. “On MDM scheme, we follow a ‘no tolerance policy’ and those involved in feeding wrong information will be taken to task,” Chouhan said. Local residents said over 1,000 below poverty line students were made to suffer due to the alleged corrupt practices of the school authorities, especially incharge of the MDM scheme, despite strict norms, they have not served any meal for a single day since March. To ensure that food reaches to each and every student present in all primary and upper primary classes and to monitor it on a daily basis, it has been made compulsory for all the incharges of the MDM scheme in every school to send a message on MDM portal every working day with details of the menu and number of students being served the meal on that particular day. “Most of the students coming to such schools are from the lower strata of society and food generally acts as a motivation,” Mubarak Wani, Lumbardar Tanta panchayat, said. He said after introduction of the MDM scheme, enrolment in the schools in the panchayat increased manifold as 95 per cent of the population belong to below poverty line (BPL) and daily based wagers.